Some publications are reporting that one of the proposals values MySpace, owned by News Corp, at between $6Bn and $10Bn – pretty good for the $580 million investment he made back in July 2005 (that’s ignoring the $900m that they got out of Google too). That deal, it’s understood, would give him 20% of the combined company. News came out via the Wall Street Journal (also within the Murdoch fold) on Wednesday. Seeing the reports gave us cause for concern. 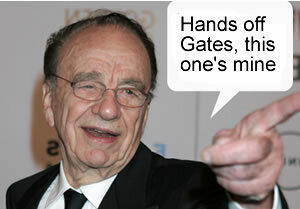 Murdoch and his considerable media interests already dominate news; printed media; TV; film and a lot of online. If he’s to get a sizeable chunk of Yahoo too, we wonder if his influence over what we see/hear/read is too far reaching.